North Cyprus sightseeings, attractions and historic buildings can be seen that there are so beautiful, all of them, but the rental car travel is possible. At any time, request the freedom to go anywhere in Cyprus car rental can be made with the most economical way. Trip Rent A Car Rent A Car company in North Cyprus, all the beauty of this historic works and cozy, comfortable and hassle-free to visit and to live in a way you can benefit from 24-hour North Cyprus car rental service at our internet site at the same time you benefit from our special fares. We have a few tips about the places you would like to see in North Cyprus sightseeing. Things to Do in Kyrenia Kyrenia from the center of the best can be seen in two ways. Due to its high located to the east of Kyrenia Kyrenia Harbour trip in the city, including the eastern side of the bird's eye view you can see the Bellapais (Beylerbeyi Village) start visiting. 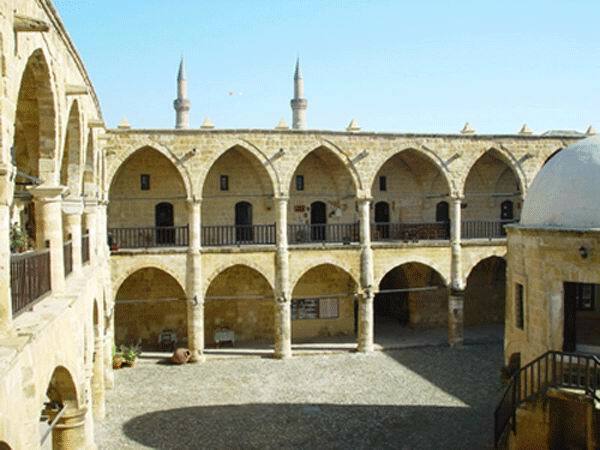 Rent your car in the village of Bellapais Monastery, Kyrenia after seeing the Kyrenia scroll to the center car parks located next to the town hall to rent one of the park arabınızı. Here is the place where the most intense shopping arcade right in the center of Kyrenia walk. After wandering around the mall in the heart of the city of Kyrenia scroll to the correct port. Here, sit down with a cold drink in the cafe and bars rest. After seeing the beauty of the harbor at the end of this Kyrenia Kyrenia Castle and the castle you can visit the museum located in the sunken ship. After touring the historic Kyrenia Castle, Girne vehicle again move towards the western side of the city center and about 5-6 km away from the beach and right next to the 1974 Peace Operation in the Karaoglanoglu Cemetery for extraction takes place you can visit. Here again, one of the most popular beaches of Kyrenia Escape beach can also swim and cool off in the summer to arrive here. Then, Nicosia - Kyrenia, Saint Hilarion Kale'sine you can go on the highway entrance. Click here to follow the same path places to visit after seeing the miracle in the Five Finger Mountains, have your picture taken there by visiting the Turkish tank. Geleb visitors from abroad to the west of Kyrenia and the smuggler was quite interesting and the pavilion or the Blue lodges in the house of Makarios sure to see his lawyer. There are a lot of historical monuments in Nicosia gezebileğeniz. Rent your car city walls of Nicosia and Kyrenia Gate moves merkizine olacaktır.Geriye be able to see the historical monuments in the city center to visit the rental car can park in one of the parking lots. From there, walk to the historic Great Khan in the Cypriot craft navigate. Here, you can continue your trip by drinking a Turkish coffee. Then from there you can visit the Selimiye Mosque near here right next to the historic Bandabulya Bazaar (Nicosia Municipal Market) You can. However, the border crossing is within walking distance Lokmacı not leave without seeing. After a nice lunch, continue your trip by car you can rent it again. Dereboyu the most popular shopping street in Nicosia region, visiting the shop. However, the Turks and Greeks on this street davrandıklarının evidence of how brutally you can visit the museum of Barbarism. By moving car here at the end of the street and the transitions of the first border gate you can see the Ledra Palace border crossing. Again, this can be seen in the Greek section in the area and you can see Yiğitler Sign offerings. In addition, you can see again, rental car and other sightseeing attractions, Dervish Pasha Mansion, Large Bath, Bazaar, Gamblers Khan, Arab Ahmet Mosque and located in Nicosia and the TRNC's founders, Dr Hamitköy a bit outside. You can also visit the memorial Fazil Kucuk. The same date as the works of Famagusta and Nicosia, Cyprus is a famous historical city. Magosa'daki can start your trip from the city center. Vacation Rentals by parking your car in the city center, there is a great-looking piece of art that can be found at the Lala Mustafa Pasha Mosque. After seeing this magnificent work you can right next to the Namik Kemal Dungeon. This is because they are both work in the city center in the city center for shopping and restaurants fatigue from the surf cafe coffee drink in there. While walking around the city will be able to see the high walls of Famagusta. Then the rental vehicle to get out of the city by the Port of Famagusta If you exit the time to act, as well as right next to the port of Famagusta Othello's Castle and the Museum of the opportunity to see the tomb and find Canbulat. Famagusta Dipkarpaz move towards the direction of Gazi (about 5 miles) on the left side of the road you can visit the Museum of Saint Barnabas Icon and Archaeology and is located right next to the name of the area due to excavations in the structural forms and rich findings also viewable at King Tombs. Then continue to the right direction when Dipkarpaz and after about 1 km on the right side you can see the famous Salamis Ruins. Rent a car to go with the most economical way to go Güzelyurt. Rental car will give you the freedom to go-anywhere at any time. The main places to see in Morphou and Güzelyurt Archaeology and Nature Museum, located in the center of the city of Saint Mamas Monastery and Ataturk Memorial. Be present in the TRNC is traditionally held every year in early summer also recommend that you visit Güzelyurt Orange Festival. Of Lefke go for the easy and economical way to rent vehicles. Soli Ruins of sightseeing places here where you can see and Vuni Palace. Dip Karpaz region of the pier and the only way to surf the rental car to go to the region. Jetty Dock Icon Museum, you can see the work. Then continue to rent your car from Dip Karpaz area you can see a bird's eye Kale'sini visit Kantara. Then again, up and down the main road towards the direction of the Karpaz Dip continue the journey. On the road on the right side of Cyprus, the famous beach Golden Beach (Golden Beach) can see. Golden Beach is a beach about 12 kilometers, will not be able to come across anywhere else to clean up his wife. Summer seasons in the sun, sea and you miss, you can convert this özleminizi a pleasure. Dip Karpaz trip here Apostolos Andreas Monastery in sustainable and can also visit the most extreme. A small note; Gazi Famagusta Karpaz just going Dip takes about 2 hours. We recommend an early start this day by day you will visit the region.